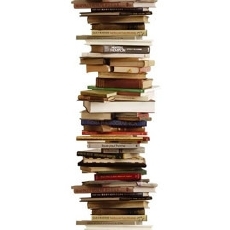 When To-Read Stacks of Many, Many Books Attack!!! I really do count my blessings, living the life I do. I've said before that books are my life. I've read lots of them. Hopefully, as I approach my impending middly bit, I'll get to enjoy at least a thousand more. I'm super lucky in that with the career I have chosen as an editor, I get to read some fabulous books before anyone else... and correct the spellings! I also read lots of books for review. Some reviewers, writing for your bigger publications, get paid for that, but for the publications I review for, I just get to keep the book. What's great about that is that sometimes you'll be asked to work on something that might not have grabbed your fancy if you'd just been browsing for something nice to read. Also, you often get free books at events like conventions and festivals, usually in a goody bag, or at author readings, sometimes. Usually, though, publishers and booksellers have also brought some along to sell, and maybe they'll offer a glass of wine to potential buyers, as well as much, much cheaper prices on the books than you'd be able to buy them for in the shops or from Amazon. And lo, I did come back from the FUTURA science fiction convention in Wolverhampton last week with just a few more (mostly free) books for my pile, which is in danger of doing me in. And for all the immaculate new books I have sitting on (rammed into all the gaps of) my shelves, I know I've got vouchers and points for more books, and of course my lovely library card, which I use (abuse) regularly. And now temptation comes my way once more, as my friends have launched a new indie-publishing marketplace called Spacewitch - a site where you can discover writing by well and lesser-known genre writers, buy their stuff, and feel happy knowing that they and their publishers get the money, not some corporate behemoth charging all sorts of fees for the pleasure of letting them make all the money instead. Well, all addicts need a programme, and I think I've come up with one. 1 - Read more books. Okay, so I'm a functioning addict.Well, I have plenty, so I shall start ploughing through. I did a 50 book challenge a couple of years ago.... can I top that? I'll start next month and see. 2. Share nicely. A friend wants us to book swap before moving our books on. I think this is a good idea. 3. Try to keep them saleable. I can then use We Buy Books to clear up some space and make a bit of money into the bargain. Maybe then, the pile of books won't land on my head and kill me. I have my phone back! It's been a week of positives and negatives. I've been feeling down as news from friends has been sad. I've missed my mom, but I have been able to spend time with my family and friends and that has been lovely. This weekend I went to a science fiction convention in my native Wolverhampton and also celebrated Father's Day and my sister's birthday with my family. This is what I made my sister. 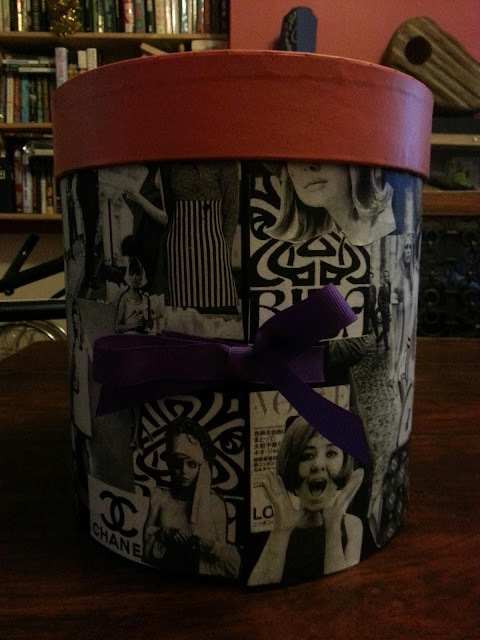 It's a jewellery box made from upcycled cardboard and decorated with sixties fashion icon decoupage. 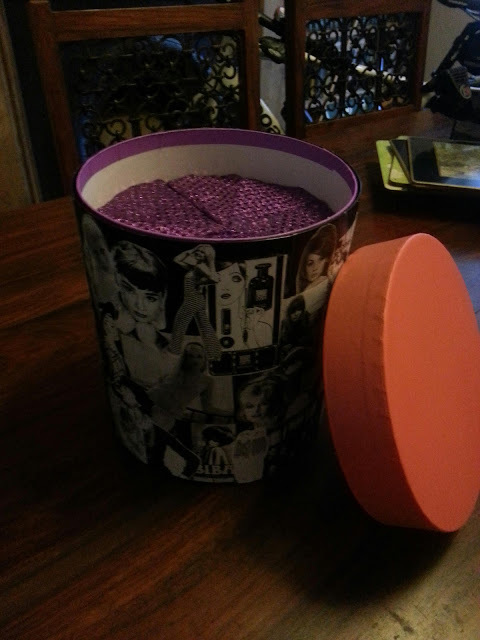 The lid has been plasticoated and the upper tier fitted with a ring holder in funky purple disco fabric. Really busy with work at the moment so going to carry on with that. Am I Becoming a Corporate Whore? I'm having another creative night tonight as I'm currently making a present for someone. 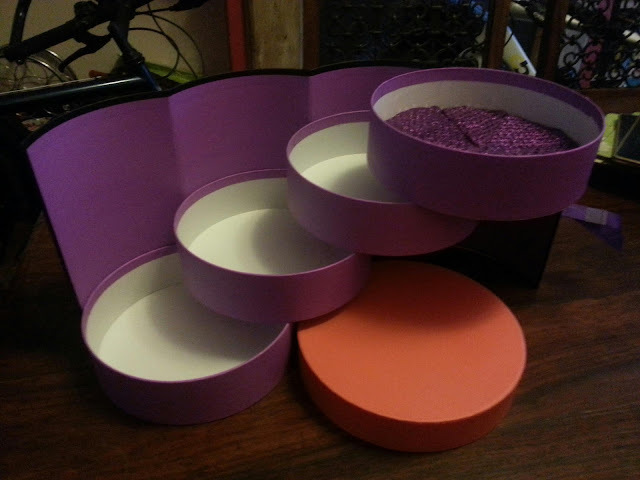 As it's a present, I can't say what it is - but it's looking cool as... I want it! Part of the process has involved spraying things in the garden with plastikote... but I am feeling guilty as more should be done in the garden than just spraying things. Things got riotous during May here, and the lawn is only partially strimmed. I don't have a garden - I have a wasteland. And the shed window has fallen out. Ah well, at least I know what I'm doimg this weekend. Thanks for the DIY vouchers, wedding guest. They came in bloody useful very quickly. I don't want to get too personal with this blog. Things could be easy and aren't. Harmony could rule... but I'm proud that I am in control, a plan is in place and my A-Z ticker now has a 2% dent in it. Woo! I have to say, my usual favourite frugal/saving blogs and their commenters are making me feel a bit sad at the moment... changes in fortune... fallings out maybe? To me it seems some people have begun a journey with a certain set of goals, and maybe now they've achieved them and moved on to other goals, they've adapted their principles slightly. Or haven't... Perhaps the experiences or ideas they are writing about no longer chime with the same set of people that their blog once did... but does it really matter? I don't think so. And now I'm not only a meat-eating traitor, I'm also a corporate whore. This week I signed up to a Nectar card, even though Mark Thomas told us all to cut up our loyalty cards and I had jolly well done so. I even downloaded the toolbar to get points for searches, so the evil machine is gathering info on me as I type. It knows I was just researching glue! It doesn't know why, only that I did. But I get POINTS! Hopefully I've redeemed myself slightly by using a more ethical cashback site. That's ICE who work with ethical companies who try to limit their environmental impact. I use it to buy my usual bus card, and any train tickets that aren't heading in the direction of London or the South East from here. It's stuff I need to use, I get it cheap and with added POINTS!!! get money off the same in the future. It's a no-brainer. I've just finished another book. London Falling by Paul Cornell. Loads of people seem to be reading this at the same time as me - great to see the book doing so well. I saw Paul last week at the British Science Fiction Association AGM and told him how I'd met people in the US reading this too. London Falling is a gritty police procedural, with a gritty supernatural edge to it. You've got Quill, with a bad temper and a drinking habit, in charge of a seemingly mundane undercover operation. He is looking after his UCs: Costain, who is half-in-love with a criminal lifestyle himself, poised to be the bad apple and go native, constantly coked up to the eyeballs; and Sefton, also UC, but hated by Costain and bullied by him for being gay. The team are trying to bring down Rob Toshack, a notorious gang lord, and Costain is on the verge of ruining the operation when he gets a sudden admission that means an arrest can take place. Toshack is taken into custody, but before evidence can be gathered by interview, Toshack suddenly dies in mysterious and violent circumstances. Lisa Ross is added to the team; not a copper but a police analyst. On a trip to one of Toshack's houses to gather evidence, the four undergo a supernatural accident and are left vulnerable to the evil souls who think they rule London, but are now also empowered to do something about them. With wicked witches, football fixes, and child murder all thrown into the pot, a highly entertaining and well-written story is brewed. And with strong language throughout, you may raise an eyebrow like you would if you learned Hary Potter had grown up to be Danny Dyer. Very intelligent horror, and the first of a series. Good oh! This weekend I took my replacement phone back to the shop. I'd not used it at all, but I had found out that my phone was covered for loss on my bank account benefits. Luckily, the shop could do this for me, as I've got ages left on my original contract. I bank with Lloyds TSB, and shortly before my honeymoon, I switched up to a Silver account, as this was the cheapest way of securing travel insurance for OH & myself... I had intended to cancel after my travels were over, but I hadn't quite got round to it.Good job! That said, I've had brilliant help from the bank, my retailer (Phones4U), and my network provider (Orange), who have all given me excellent advice on claiming and securing data for the future. So - passing on what I have learned this week. You may not need to take out separate insurance. Check your house insurance or any benefits that come with your bank to see if you are covered. Your policy may specify restrictions on coverage or insist you register your phone details before allowing you to make a claim. If you do want to take out specialist insurance, make sure it really does specialise in the kind of things that you want covered. Some insurers won't cover loss, and will only cover theft if that theft involves threat to life or violence. So, if you feel yourself getting pickpocketed, and turn round only to see the perpetrator melt into the crowd, you may not be covered! You may find they don't insist if you have taken all necessary steps to restrict the use of the phone - that's making sure the sim is cancelled with the network provider, and your phone blacklisted. You can doubly assure that your property can't be resold easily by registering your product details on www.immobilise.com. Good for other stuff too (laptops, bikes etc), not just mobiles! The phone can be registered retrospective of loss as well, so just make sure you make full use of your man drawer and keep hold of the box! Why? Because that's where you'll find your IEMI number - that's your phone's unique identifier, that is - not your screensaver of a sad-looking cat. Back-up, Back-up, Say What You Gonna Do Now? I lost the videos of OH swimming with dolphins because I didn't back them up. Technicaly, i backed up a few of the photos from our honeymoon because I posted them on Facebook. She also mentioned Skype, for free face to face conversations instead of expensive video calls, Viber - which lets you call and text for free internationally, and Whatsapp, which is a free cross-platform messaging app. So that's my advice... and it was recycled, too. I've done well to type all that, covered in glue as I am. I am becoming card-making queen. I have to go to a 50th birthday tomorrow, so have been making a card that says 'Fabulous' in large, friendly pink letters, with girly acoutrements made from foam and sparkle stickers. I made one for a wedding last week, too! I'm hoping the recipients like them as much as I liked making them. I will have to do the weekend writeup another time, I'm afraid. Lots to say... but my eyes are drooping.